Buy both videos and Save! 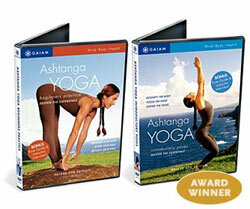 Designed to make Ashtanga easy to learn as you sculpt muscles, elevate your heart rate and cleanse out toxins. Introductory Poses (85 minutes) teaches the basics. Designed to make Ashtanga easy to learn as you sculpt muscles, elevate your heart rate and cleanse out toxins. Introductory Poses (85 minutes) teaches the basics. Beginners Workout (100 minutes) is more active. With Nicki Doane.